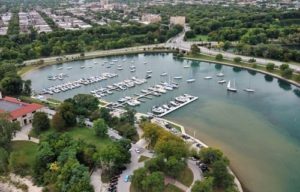 Of the ten harbors operated by the Chicago Park District, two are occupied predominately by sailboats: Monroe Harbor, east of Lake Shore Drive at the end of Monroe Street, and Jackson Park Outer Harbor, east of Lake Shore Drive in Jackson Park. Though differing in important ways, they share characteristics that distinguish them from the other harbors. At Monroe, boats are on moorings spaced well apart, so noise is diffused across the large harbor. Jackson Outer is a small, almost exclusively sailboat harbor, so powerboat noise and partying is minimal. 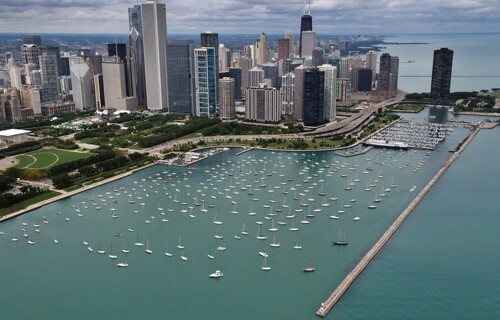 Monroe is the picture postcard harbor of Chicago and has a spectacular view from the water, day or night, of Chicago’s skyline. You see Buckingham fountain every time you sail into the harbor and at night, you have on-the-water seating for Navy Pier fireworks. Download our Monroe Harbor profile here. Jackson Outer is in a secluded corner of Jackson Park, adjacent to picturesque Promontory Point and is ringed by rows of stately trees. Standing on a grassy incline above the lagoon, you almost feel as though you are on a private estate. Both harbors have a large water area compared to the number of boats, so neither reminds you of a crowded mobile home park. • Boat access advantages. In Monroe all boats are on moorings spread widely throughout the harbor. Other harbors also have moorings, but at Monroe, you and your guests have free tender (water taxi) service to and from your boat. At the other harbors you need a dinghy to row guests and yourself out to your boat. At Jackson Outer, your boat is on a slip fifteen yards from the parking area. Elsewhere on a slip, you could have a longer walk from the parking area to your dock, a longer walk along the dock to your boat, or most likely, both.